Divination by throwing laurel leaves on a sacred fire from a grove sacred to Appollo. If the leaves crackled in the flames, the forecast would be favorable; if they burned quietly, the prophecy was negative. 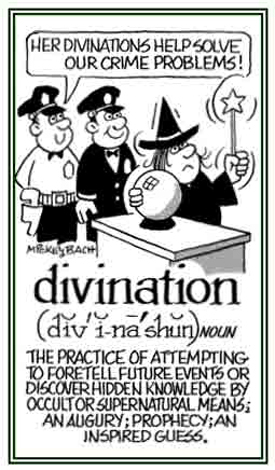 Divination by calling on demons for prophecies as in black magic. Divination through the use of oak and mistletoe. 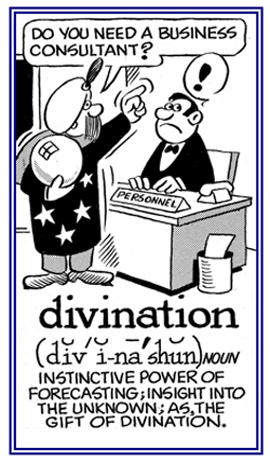 Pertaining to divination; divinatory, magical. 1. A person who claims to discover hidden knowledge with the aid of supernatural powers. 2. Someone who searches for underground water, metal, or minerals using something such as a divining rod. This diviner can't even see the present much less the future. The financial adviser was seeking guidance for future investments via the crystal ball and may now have just seen a prophecy of a "crash" in the stock market. Divination by interpreting the crackle sound of a laurel branch on a fire (the same as daphnomancy). Divination by observing dripping blood. Divination with olive oil, or another kind of oil; and analyzing its patterns and designs on a liquid surface. Divination by observing fire and smoke, or the objects, on a sacrificial fire. Eggs, flour, and incense were used for this purpose as well as shoulder blades of the sacrificed victim. Divination or fortune telling with mirrors: The seer walked down to the river carrying a looking glass in order to conduct the enoptromancy which she had promised to do for the villagers. Divination by examining the entrails of animals. Oriental (Persian) divination in which a person covered his head with a cloth and muttered questions above a vase of water. Stirrings on the surface would be regarded as a good omen. Divination by examining animal entrails. Showing page 6 out of 16 pages of 227 main-word entries or main-word-entry groups.